Royals are not messing around! We like to catch up with Herb Bynes and see how his team is doing. Last time it was just at the beginning of the season, and you can read it HERE. Now, the regular season is done, and Royals are 7-1. "The season has been good so far. 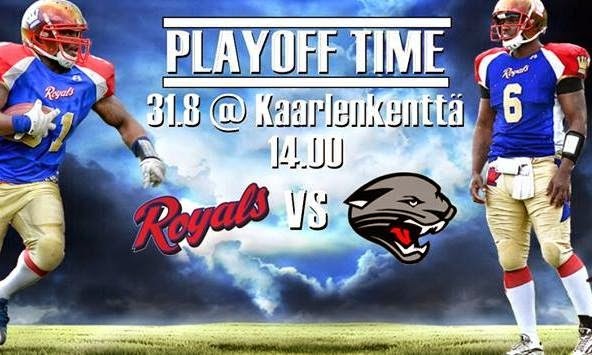 Our previous game was against Tampere Saints, where we won 33-21. We had a few injuries and couple guys sick but we managed to get the job done. Our record is 7-1 and we hope to continue our focus into the playoffs." - says Bynes. The playoffs start this weekend and Bynes has high expectations: "In the playoffs we'll play against the Jaguars. Our goal is to win and execute in every aspect of the game. My expectations is to dominate the game from the 1st quarter and stay on the gas pedal for the remainder 3 quarters afterwards. Championship is the prize in which we're seeking to accomplished."